The salt copper(II) sulfate as the mineral chalcanthite. In acetate (CH3CO2-); and can be monatomic, such as fluoride (F−), or polyatomic, such as sulfate (SO42−). There are several varieties of salts. Salts that hydrolyze to produce hydroxide ions when dissolved in water are basic salts, whilst those that hydrolyze to produce hydronium ions in water are acidic salts. Neutral salts are those that are neither acid nor basic salts. Zwitterions contain an anionic centre and a cationic centre in the same molecule, but are not considered to be salts. Examples of zwitterions include amino acids, many metabolites, peptides, and proteins. Usually, non-dissolved salts at standard temperature and pressure are solid, but there are exceptions (see Molten salts and ionic liquids). Molten salts and solutions containing dissolved salts (e.g., sodium chloride in water) are called electrolytes, as they are able to conduct electricity. As observed in the cytoplasm of cells, in blood, urine, plant saps and mineral waters, mixtures of many different ions in solution usually do not form defined salts after evaporation of the water. Therefore, their salt content is given for the respective ions. 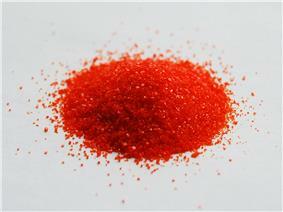 Potassium dichromate, a bright orange salt used as a pigment. Salts can appear to be clear and transparent (sodium chloride), opaque, and even metallic and lustrous (iron disulfide). In many cases, the apparent opacity or transparency are only related to the difference in size of the individual monocrystals. Since light reflects from the grain boundaries (boundaries between crystallites), larger crystals tend to be transparent, while the polycrystalline aggregates look like white powders. Most dyes, are salts. The color of the specific salt is due to the electronic structure in the d-orbitals of transition elements or in the conjugated organic dye framework. Salts of strong acids and strong bases ("strong salts") are non-volatile and odorless, whereas salts of either weak acids or weak bases ("weak salts") may smell after the conjugate acid (e.g., acetates like acetic acid (vinegar) and cyanides like hydrogen cyanide (almonds)) or the conjugate base (e.g., ammonium salts like ammonia) of the component ions. That slow, partial decomposition is usually accelerated by the presence of water, since hydrolysis is the other half of the reversible reaction equation of formation of weak salts. Many ionic compounds can be dissolved in water or other similar solvents. The exact combination of ions involved makes each compound have a unique solubility in any solvent. The solubility is dependent on how well each ion interacts with the solvent, so there are certain patterns. For example, all salts of sodium, potassium and ammonium are soluble in water, as are all nitrates and many sulfates - barium sulfate, calcium sulfate (sparingly soluble) and lead(2) sulfate are exceptions. However, ions that bind tightly to each other and form highly stable lattices are less soluble, because it is harder for these structures to break apart for the compounds to dissolve. For example, most carbonate salts are not soluble in water, such as lead carbonate and barium carbonate. 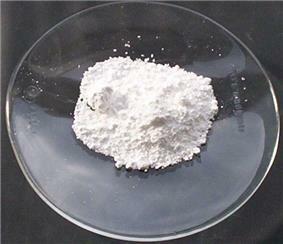 Soluble carbonate salts are: sodium carbonate, potassium carbonate and ammonium carbonate. Solid salts do not conduct electricity. However, liquid salts do. Moreover, solutions of salts also conduct electricity.